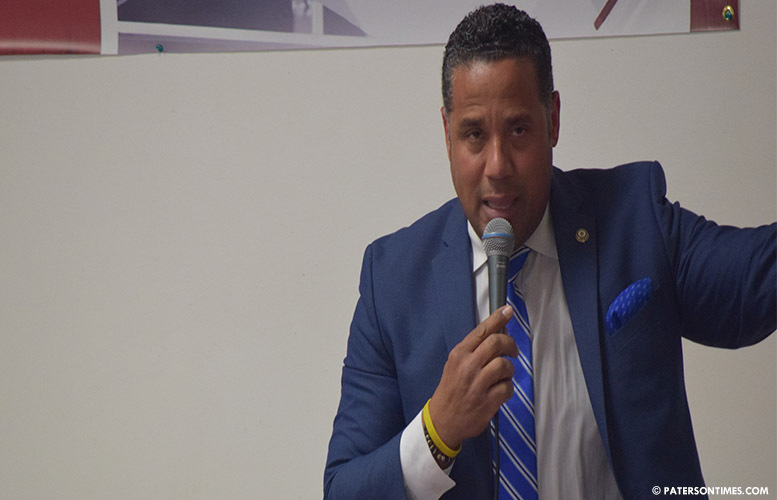 Councilman Alex Mendez took ownership of his bounced check problem at the City Hall debate on Monday afternoon while claiming the court judgments against his two companies aren’t his. Mendez’s responses were prompted by a question from former school board member Pedro Rodriguez. Rodriguez listed Mendez’s personal, business, and campaign finance problems. 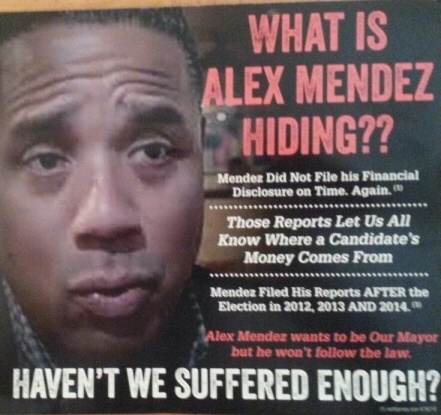 Mendez’s campaign issued 46 checks that bounced. His family home has outstanding liens from 2013 for unpaid sewer bills. He was issued half-dozen late notices with threat of water shut off for failure to pay Passaic Valley Water Commission bills on time. His two companies owe more than $14,000 in judgments to the state. “How can the people of Paterson trust you to be a responsible mayor looking at your track record?” asked Rodriguez. “I take full responsibility for that oversight. All those checks are being satisfied,” said Mendez. Mendez would not take responsibility for the judgments against his companies. “Those judgments are not mine. You got to do your homework better,” said Mendez to Rodriguez. Rodriguez’s campaign uncovered some of the judgments through opposition research. Mendez’s companies Liberty Transport Group LLC and Say Investment Holdings LLC, both of which did business as Josie’s Limousine Service out of Secaucus, owe a combined $14,361.98 to the New Jersey Department of Treasury and the New Jersey Department of Labor, according to court records. Mendez defaulted on a Wells Fargo account. He owed the bank $1,085.99 with interest. In 2012, Security Credit Services, a collection agency, filed in court securing a $1,323 judgment against Mendez that remains open. The Paterson Times retrieved documents from the Passaic County and Hudson County Courthouses to verify the judgments against Josie’s Limousine Service, a company Mendez owned. Mendez’s state treasury records, and a decade of taxi applications submitted by his limo company to the government in Secaucus were reviewed. Mendez went after Rodriguez after answering his question. He said Rodriguez’s job at the municipal government was created by mayor Jose “Joey” Torres. Rodriguez, who worked for the Torres campaign four years ago, received a $73,000 telecommunications system analyst post at the police department. “If you are talking about corruption, you are the most corrupted person sitting here,” said Mendez. All six men were present for the debate. Others present at the high security debate — there was visible police presence on every floor; police required ID checks at lobby desk — were councilmen Andre Sayegh, Michael Jackson, William McKoy, and police officers’ union president Alex Cruz. Rodriguez has defended himself by asserting he had to pass a civil service exam to get his municipal job. He also distanced himself from Torres when it emerged the former mayor had stolen from taxpayers. Mendez exchanged fire with Sayegh and Rodriguez at the City Hall debate. There is no credible poll showing the frontrunner in the six men race. THE MORONS IN THIS TOWN WILL VOTE BASED ON RACE ,NOT ON THE FACT THAT THIS DOPE ISN'T FIT TO BE IN ANY TYPE OF LEADERSHIP POSITION. He does not have my vote! This coming from a fellow Latino.